A haven in the mountains, Hakone has long been a popular destination for the citizens of Tokyo to unwind amidst the arms of Mother Nature. Waterfalls, picturesque villages and hot springs pepper the wooded mountains that encircle the heart of Hakone: the tranquil waters of Lake Ashi. 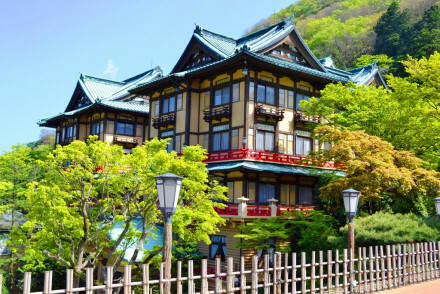 The perfect place for a spa-break or a hiking holiday, Hakone is a truly magical place and our collection of the best places to stay in Hakone will put you under her spell. Hakone is where the residents of Tokyo come to enjoy the famous hot springs (known as "onsen" in Japanese); the area brims with spoiling spa hotels and geothermal baths. Mount Hakone is an active volcano: the "onsen" are heated through underground springs that warm the water to 70 degrees, and subsequently feed the springs dotted across Hakone. Life in Hakone moves slowly and thoughtfully. The perfect place to lose yourself in, it is full of waterfalls and lush forestry. During the autumn months, the trees shine brightly - a mix of evergreen, golden and red leaves - making it an intimate and romantic place. Put simply, it is a wonderful place to stroll and let your thoughts wander. Take the Tozan Cable Car, running from Sounzan to Lake Ashi, and drink in the amazing views of the mountains. Explore the Owakudani Geothermal Valley, a crater on the mountainside - an active volcano omitting sulphurous fumes. Stand at the famous Torii Gate overlooking Lake Ashi and explore the Hakone Jinja, a Shinto shrine. Get lost in the Open-Air Museum and admire the hundreds of sculptures scattered about - from the likes of Picasso and Henry Moore! Float happily along the waters of Lake Ashi, bathing in the glorious views of Mount Fuji. Soak in one of the many hot springs of the area, heated by the underground fires of a volcano. Hakone is the quintessential place for a spa-break. Pristine mountain air and delightful hot springs offer holidaymakers the chance to truly unwind. 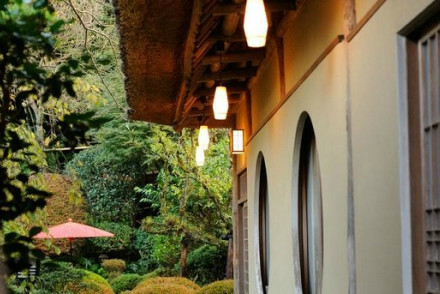 And our pick of the best places to stay in Hakone are ideal bases whether you're here for sightseeing or pampering! 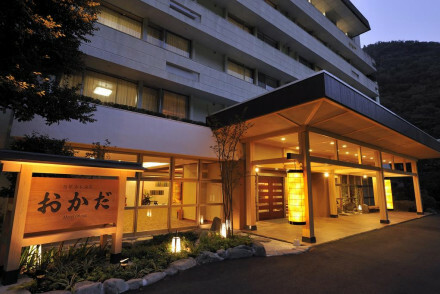 The Fujiya Hotel claims to be one of Japan's oldest hotels, and offers elegant and spacious rooms with a European air to them. The hot springs and picturesque gardens offer guests ample opportunity to unwind. The Fukuzumiro is a traditional hotel offering classically Japanese-rustic rooms complete with tatami mats and paper lanterns. The gourmet restaurant serves sumptuous regional fare and guests can unwind in the hot springs. 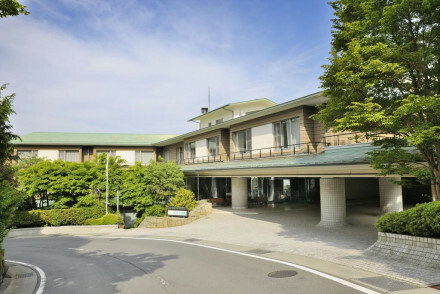 Hotel Okada: boasting 5 fountainheads drawing hot spring water from a nearby mountain, this hotel offers classically Japanese rooms with epic views. There are hot thermal baths scattered throughout the hotel. For a different type of unwinding, check out their very own karaoke club! Hotel Senkei: simple rooms, polished wooden floors and private hotspring baths, this charming and small hotel stands in a forest. Secluded and lovely, the spa offers rejuvenating treatments. 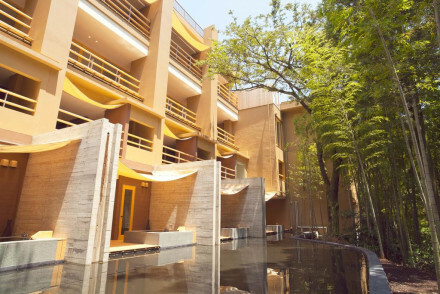 Kinnotake Tonosawa: architecturally-stunning and in a secluded wooded location, offering 23 airy and minimalist rooms. 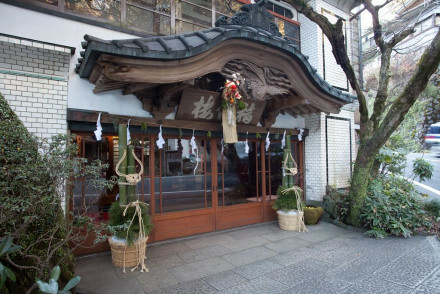 The traditional restaurant serves up Kyo Kaiseki-style dining, and the grounds surrounding her are wonderful to get lost in. The best time to go is during the autumn, when the leaves glisten gold and red and the temperature remains clement, between 10 and 26 degrees. 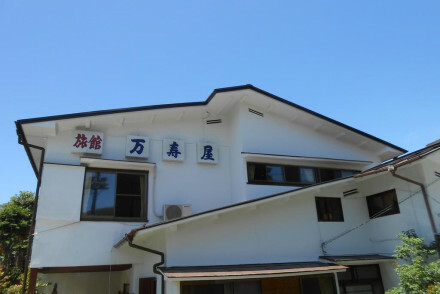 A traditional guesthouse featuring Japanese style rooms and warm hospitality. Experience sleeping on roll down futons and bathing in the customary fashion. A hot spring bath is the ideal spot for unwinding after a day exploring the region. An authentic stay. Local exploring - A charming guesthouse well placed to explore the region. A traditional property set in manicured gardens and boasting the title of being one of Japan's oldest hotels. Spacious rooms are light and airy with a distinctly European feel. Numerous hot spring baths offer ample opportunity for unwinding. An elegant setting for relaxing breaks. Country Escape - Set in beautifully manicured gardens and offering complete tranquility. Great walks - Take gentle strolls through the Japanese gardens. Sights nearby - Play a round at the hotel's golf course. A grand hotel set in stunning rural surrounds. Situated at the source of a natural hot spring find numerous baths throughout the property to aid healing and relaxation. Contemporary rooms are inspired by Japanese design and boast large terraces and epic views. A spoiling rural escape. Spa breaks - The property boasts 5 fountainheads providing hot spring water directly from Mt. Yusaka. Great walks - Take scenic strolls straight from the property. Swimming Pool - Indoor and outdoor pool. A traditional property set within a picturesque forest. Japanese styled rooms feature tatami mats, roll-down futon beds and paper lanterns. Feast on regional dishes in the restaurant and unwind in natural spring baths. A charming rural escape. Local exploring - An authentic property, ideal as a base for exploring the region. Great walks - Find numerous scenic trails along the river and through the forest. Sights nearby - Take a stroll to the Amida-ji Temple. A charming traditional property set amidst a picturesque forest. Simply dressed rooms feature polished wooden floors, floor to ceiling windows, sink-into beds and private hot spring baths. Japanese meals are served in-room in the customary style. An authentic experience. Country Escape - An authentic Japanese rural escape complete with hot spring baths and stunning surrounds. Great walks - Take an amble along the scenic Ashi Lake shores. Spa - Gespa salon offering rejuvenating treatments. A chic rural property offering luxury accommodation in utterly tranquil surrounds. Rooms mix contemporary style with classical design and each boast private hot spring baths. Regional cuisine is lovingly prepared and served in the traditional manner. A relaxing base to explore the region from. Country Escape - A contemporary property hidden in a tranquil forest. Great walks - Take a stroll through the Odawara Castle Park. Sights nearby - Find numerous ancient shrines in the area. A luxury property set amidst a forest and surrounded by mountains. 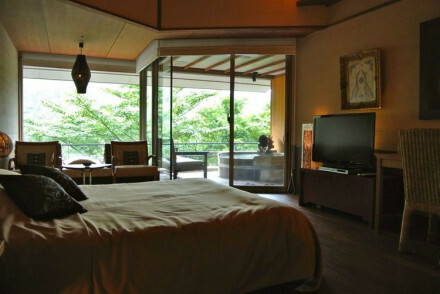 Contemporary rooms boast stunning views, the best have open-air baths and tatami areas. Japanese and fusion cuisine is served in the restaurant. Find numerous outdoor pursuits in the area. An indulgent rural escape. Country Escape - A tranquil rural abode with plenty of outdoor pursuits on offer. 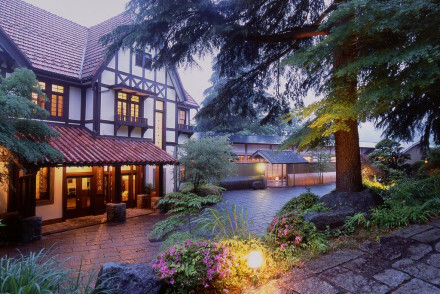 The luxurious Gora Kadan is located amidst the mountainous beauty of Hakone's countryside. Formerly the holiday choice of the imperial family, it boasts chic and spacious traditional Japanese accommodation but with Western-style beds. A top-class and incredibly peaceful stay! 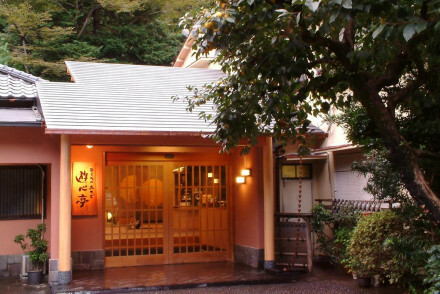 The idyllic Ginyu Ryokan is set amidst Hakone's mountains and luscious forests. It offers traditional Japanese-style accommodation with private onsens on the terrace-perfect for enjoying the view! Enjoy lovely kaiseki cuisine in their restaurant. An utterly rejuvenating and peaceful stay. Country Escape - Ginyu Ryokan boasts a fantastically scenic location! An architecturally stunning hotel boasting an enviable forest location. Rooms have a modern, organic feel with a touch of traditional Japanese style; think plenty of wood, clean lines, picture frame windows and hot spring tubs. A speciality restaurant serves up "Kyo Kaiseki" style dining. Fabulous. Total relaxation - Hidden away in a forest and with each room boasting a private hot spring bath. Sights nearby - Under a mile from the property is Sounji temple dating back from 1521. Restrictions on children - Children under 12 cannot be accommodated.